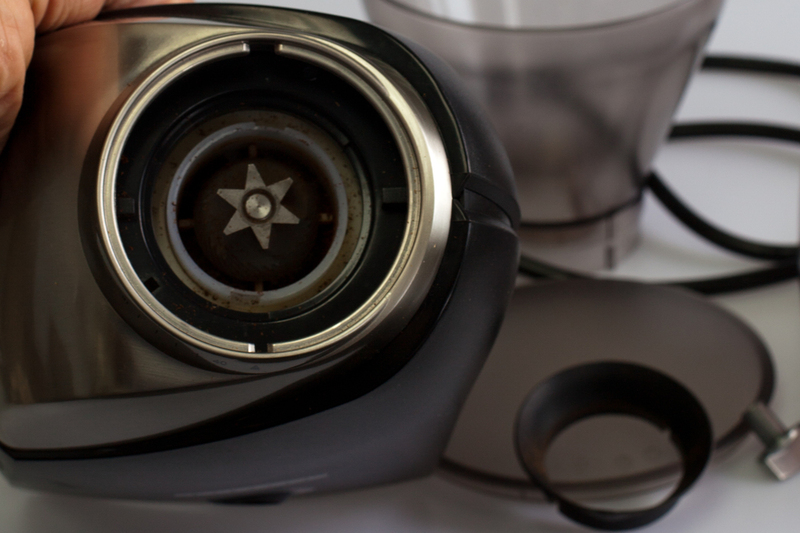 We have done a comparisson of the Baratza Virtuoso and the Capresso Infinity. As part of the due course of our business, we end up working with a bunch of different equipment. It allows us to work with these machines several times a day, with varying and sometimes huge usage in a single sitting. As a result, we end up with some pretty strong opinons on what might seem like minor differences. The same is true of our conical burr grinders. When we first started brewing, we bought ourselves a top-of-the-line Baratza Virtuoso ($212 on Amazon.) After working with that grinder for almost two years, we started to realize that there was room for improvement in the design of the grinder. 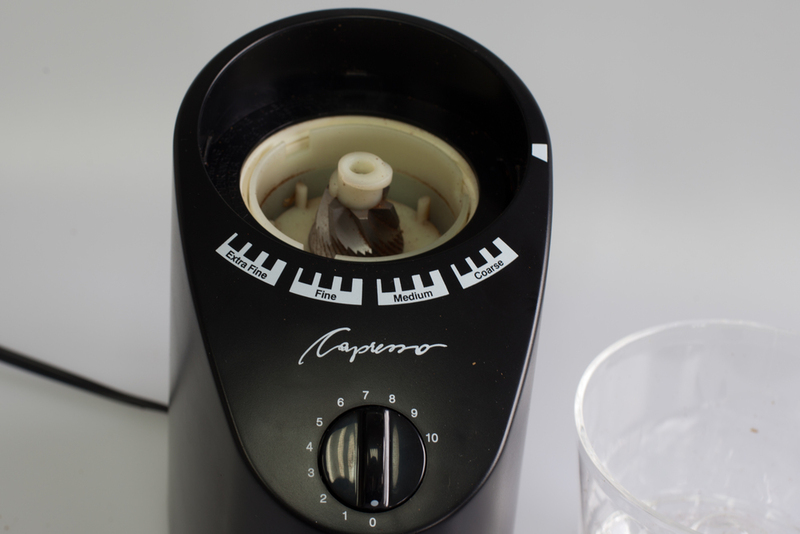 Recently, we tried the Capresso Infinity ($88 on Amazon). At less than half the cost, the grinder was surprisingly good. It does, however have some flaws as well. Here we go! The Virtuoso is the preferred home/mobile grinder of many of the higher end coffee shops. It isn't a Ditting, but then again it doesn't look like it belongs in a woodworking shop. For a 'home' machine, it is of surprisingly good build. The plastic used in the hopper, and the grinds container are both made out of matte, static free plastic. It does it's job consistently, and well, but it does have some problems. - 40 Grind settings for good control - Fairly Quiet - Consistent Grind - Overall quality feel to the machine. Cons: - Very Heavy - The metal section is only held to the main body of the grinder with two screws. We use them for tastings, but we are on our third grinder in 18 months due to breakage. - The knob for the timer section falls off all the time. Literally all the time. - Quite expensive - The Grind chamber gets some grinds stuck in it. The capresso is significantly smaller, significantly lighter, and significantly cheaper. It feels more like other grinders you may have experienced, but it has a better, more consistent grind and it's designed to be easy to clean. The machine is significantly quieter than the Virtuoso, keeps pace in terms of rate of grinding, and does a respectable job. That being said, it has a significant flaw that prevent it from being the obvious choice. Cons: - This is the big one: the chamber where the grinds fall, before going into the container you access is far too large. A significant amount of coffee gets stuck there and either A) you live with old coffee in your grinds (then why bother grinding fresh?) or B) you spend a significant amount of time getting it out with a tiny brush. Now I don't mind a bit of detail-oriented busy work, but I needed to do it every time I ground and that was too much. Mucilage in particular seems to end up stuck in here. - 16 Grind Settings leave something to be desired. - Plastic of the hopper and the grind container have static and some grinds always end up stuck to them. 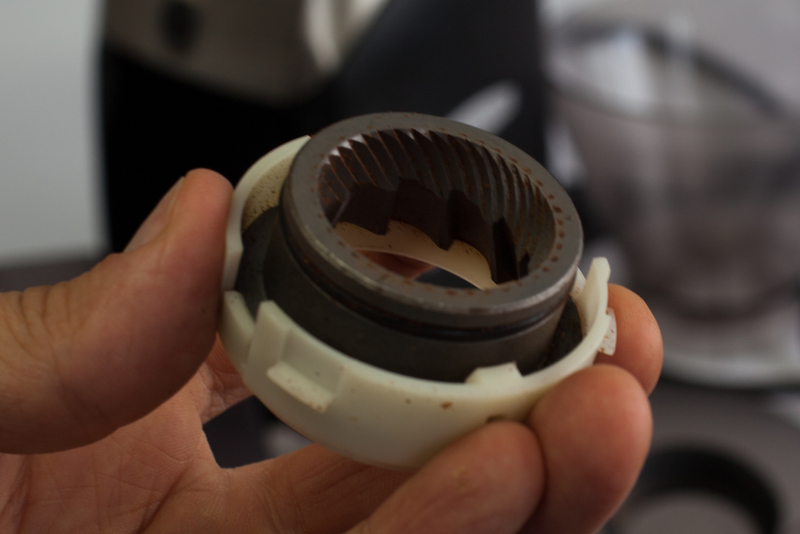 - The coarsest setting isn't exactly what we would like for French Press. It needs to be able to get a tiny bit coarser. Conclusion: Neither of these grinders is perfect. I've done up a diagram (see below) of how the issue of grinds getting stuck in the chamber could be mitigated. 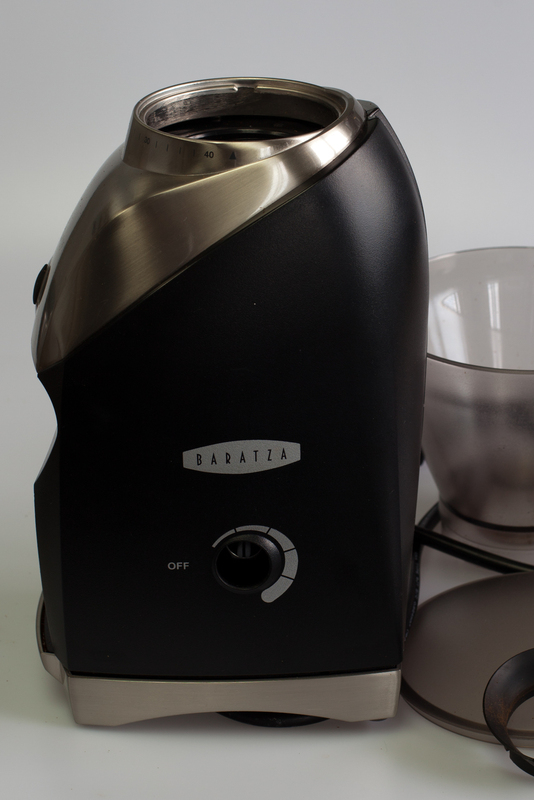 Overall the Baratza feels nicer, and is more adjustable, but is too fragile, and has a really annoying knob that isn't held on by anything at all for some reason. Ultimately the Virtuoso is the only option if you like french press. The Capresso is less than half the price, and feels it, but grinds very well and if you are willing to brush out the grind chamber, is the obvious choice for chemex or pour over. To be honest, I'm not sure why the floor of the grinding chambers are flat. I know that the motor that actually drives the grinder needs to go somewhere, but I would accept a 2" taller machine, if it meant that grinds weren't always stuck in it. Ideally, the grinder would dump directly into the container, but until someone invents a U-shaped motor, that seems unlikely. An improvement over the current situation, however, would be a sharply sloped floor that directed coffee into the grinds container. I know it would add to the height of the machine, but if it meant that I didn't have to disassemble the machine for cleaning after every use, it would be the obvious decision. Newer PostCoffee and Canines Event - Hot Dog!